July 11, 1966, R. E. Miller. 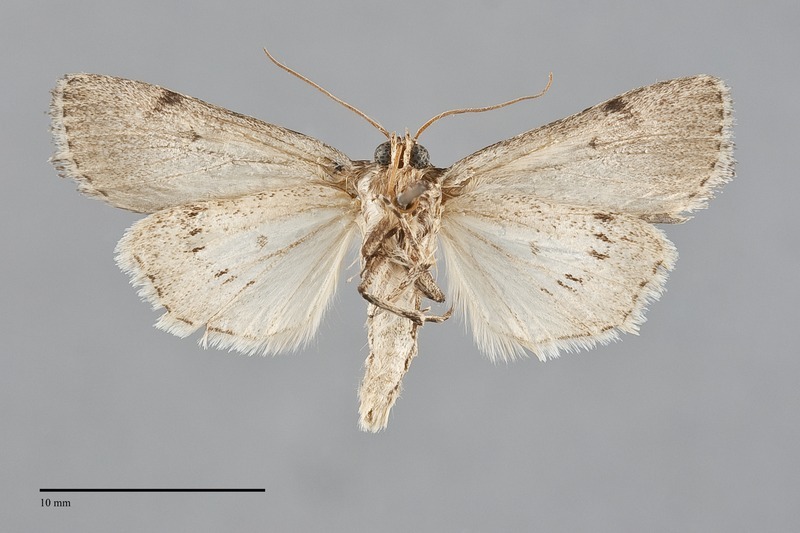 Sympistis punctilinea is a plain gray-tan small moth (FW length 13 mm) with dark thin antemedial and postmedial lines that are slightly thicker on the veins and a pale gray-brown hindwing that flies in southern Idaho during late summer. The forewing is slightly powdery with slightly gray suffusion that is strongest in the subterminal area. The veins are slightly darker, especially on the distal third of the wing where they produce a mottled pattern of light and dark in the terminal area. The lines are dark gray-brown, with a light shade of the ground color along the antemedial and postmedial lines outside the medial area. The basal line is short, located near the base. The antemedial, median, and postmedial lines are thickened on the costa to form three spots. The antemedial and postmedial lines are slightly thickened on the veins, most notably along the entire postmedial line. The antemedial line appears bilobed; it is sharply excurved from the costa through the cell, then drawn acutely toward the base on the cubital vein before curving to meet the trailing margin at a right angle. The median line is barely visible except on the costa. The postmedial line is prominently excurved through the cell similar to the antemedial line, then straight at a strong oblique angle toward the base to the trailing margin. The subterminal line is pale, patchy, and faint. The terminal line is thin, gray-brown. The fringe is tan to light gray with faint barring. The orbicular and reniform spots are inconspicuous, a pale shade of the ground color filled centrally with the ground. The orbicular spot is oval and the reniform spot is kidney-shaped. There is no claviform spot. 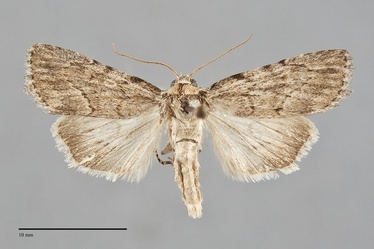 The hindwing is whitish gray-tan, shaded with darker brown-gray toward the margin. A postmedial line is evident as dark gray marks on the veins on the mid-wing. The veins and discal spot are pale gray, and the thin terminal line is dark brown-gray. The hindwing fringe is light gray. The head and thorax are mostly gray-tan, with a tan collar with a dark line across the base. The male antenna is filiform. Although this species is dull in color it can be recognized by its simple pattern of dark lines with slight thickening along the veins, bilobed antemedial line that is drawn toward the base on the cubital vein, and postmedial line that is fairly narrowly convex toward the outer margin near the costa. If necessary, the presence of a claw on the distal foretibia - a feature of most Sympistis species, can be examined to confirm the identity. This species is widely distributed in riparian habitats at low elevations across the Southwest, extending northward in the Great Basin. It may also occur in urban areas where ash trees have been planted for shade. Sympistis punctilinea has been collected in south-central Idaho in the Northwest. The range of this species includes California and the Intermountain West. It has been collected in Utah, Nevada, and Arizona. This species is a foodplant specialist feeding on ashes (Fraxinus spp.) in the Oleaceae. 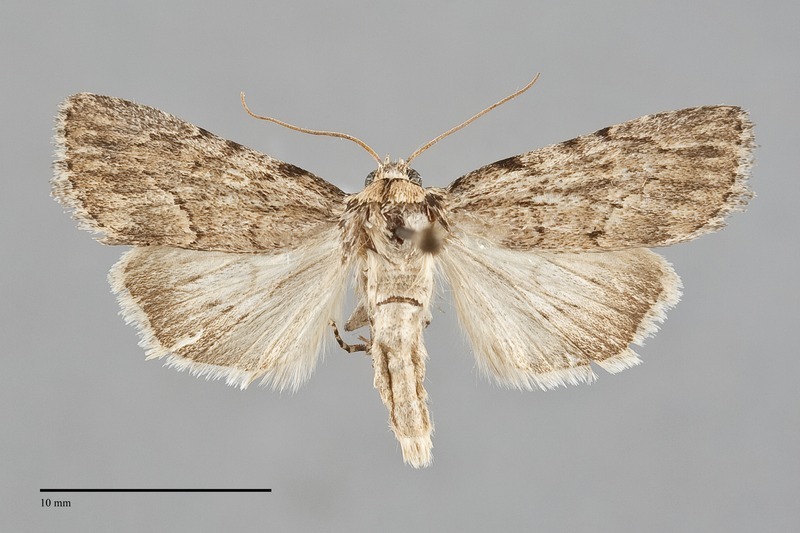 The flight period of S. punctilinea is July in our region. It is nocturnal and comes to lights.